On Monday the 18th inst. A Grand Cricket Match was played, between eleven gentlemen amateurs of Cosgrove, in this county, against eleven gentlemen amateurs of Castle Thorp, in the county of Buckingham, for a considerable sum money; after a most severe and well contested game (in which individual and collective talent shone conspicuously), the former proved victorious. The ascension of Lunardi, in his balloon, some years since, collected an immense concourse, but the number of the spectators on this occasion exceeds the power of the pen to describes.This well-contested match was decided in favour Cosgrove, by four runs only. Northamptonshire Cricket a History J.D. On one occasion, harking back to Northants, In September 1820, for a considerable sum of money, a ‘Grand Cricket Match’ was played between ‘Eleven Gentlemen Amateurs’ of Castle Thorpe in the county of Buckingham, which match gave rise to some curious reporting in the Northampton Mercury: ‘The ascension of Lunardi in his balloon, some years since, collected an immense concourse, but the number of the spectators on this occasion exceeds the pen to describe. This well-contested match was decided in favour of Cosgrove by four runs. CRICKET. Wolverton v. Cosgrove. On Wednesday last very interesting game at cricket was played between the Cosgrove and Wolverton juveniles. After some very good play the Wolverton heroes came off victorious. The batting of Master Thomas Dudley was first-rate, and much admired by the spectators present. CricketOn Saturday a very interesting game was played between the Old Wolverton and Cosgrove Clubs. On this occasion the Old Wolverton gentlemen proved too much for their experienced opponents. Both elevens were in good practice, and prior to the commencement of the game the Cosgrove side were the favourites with odds, but as a game of cricket is never won until it is lost, to the surprise of the gazing and anxious spectators the Wolvertonians came off victorious, as the following scores will show :Wolverton First innings, 31; second innings, 67; Total 101. CosgroveFirst innings, second innings, 27. Total 50. SINGLE WICKET. On Saturday the 15th instant, a match came off on the Cosgroveground between two players of that place and two of Wolverton. The Cosgrove youths came off victorious, beating their two sanguine opponents easily . Old Wolverton, 1st innings, 71 2nd innings, 68; total, 139. Cosgrove, 1st innings, 34; 2nd; innings, 37; total, 71. COSGROVE v. NEWPORT PAGNELL. This return match was played at Cosgrove on Saturday, August 15th, and was won by the home team by two runs on the first innings. CASTLETHORPE v. COSGROVE.This match was played on Saturday last between the junior elevens of each of the above places, with the following result. COSGROVE C. V. WOLVERTON RATCLIFFE C. Played at Cosgrove on June 27th, and won by the home team by 17 runs on the first innings, the scares being 66 and 49. R. Brown (20) and Atterbury (16) were most successful with the bat for the winners, while for their opponents R. Packer (25) made the most runs. Cosgrove v. Wolverton Ratcliffe. This match was played on Saturday, June 27, and resulted in favour of the home team. WOLVERTON BRITANNIA v. COSGROVE. Played at Cosgrove, when the visitors had the game in their own hands, scoring 147 for seven wickets, to 27. For the winners Winterbottom made 67 not out, and Clay 26 not out, Newman 13, and Hills 11. Clark was the only man in the team who made double figures, scoring 12. In the bowling Winterbottom and Archer each took five wickets for the Britannia. ST. GEORGE'S v. COSGROVE. This match resulted in an easy victory for Cosgrove. Scores: Cosgrove, 96; St. George's, 1st innings 20, 2nd innings 34. The highest individual scorers were : Cosgrove, Smith (27), Brown (15), and Hilton (20, not out) ; S -. George's, James (7 and 14), 1 and Atterbury (10). In bowling Bryan, for St. George's, took five wickets for 24 runs, and Clarke and Brown bowled well for Cosgrove. WOLVERTON BRITANNIA v. COSGROVEThe return match between these clubs came off on Saturday afternoon at Old Wolverton, the home team suffering defeat on the first inning, by 22 runs. Newman (15) and Hills (9) were of most advantage to their side during the first innings, and Brown secured seven wickets. The Cosgrove innings amounted to 69, J. Smith playing a valuable 34. Winterbottom was the means of the downfall of most of the wickets. In the second innings the Britannia seared 52 for sin wickets. Score WOLVERTON. First Insin.es Second Innings the Britannia scored 52. WOLVERTON (L. AND N.-W. ELEVEN) V. COSGROVE. These teams met on Saturday in the "Big Field," when the former, after a very exciting finish, won by six wickets. The winning hit was not made until about minute before time. Scores : Wolverton, L. and N.-W.: 1st innings, ; 2nd, 46, for four wickets. Cosgrove : 1st innings, 37 ; 37. For L. and N.-W. the Rev. P. R. Harnett made 8 and 7 (not out) respectively, Worrall 4, Jones 12, Lloyd 9 (one six), and Dixie 7 (not out), while in bowling in the first innings Jones took three wickets for 14 runs, and Dixie two wickets for 8 runs, Lloyd two and Worrell one. In the second innings Dixie took six for 20 runs, Jones one. Lloyd one, Rev. F. R. Harnett two for 3 run 6. For Cosgrove, Bugby made 6, Wise 11 and 7, Weston 5, Lawless 6, and Atterbury 8; and bowling in the first innings Brown took six wickets and Lawless four; Lawless also taking three in the second innings. WOLVERTON BRITANNIA V. COPMMY R. This match was played on Saturday last at Old Wolverton, the home team very nearly pulling off the game by a single innings victory. The Britannia were set 48, loose fielding on their part accounting for 13 runs, and, thanks to the free display of Davis, Winterbottom, Hills, and Beckles, 84 was placed to their credit. The collapse of the Cosgrove team in the second innings was very marked, Davis and Lawless being responsible for 7 wickets for the small total of 12 runs. WOLVERTON L. AND N.-W. (SECOND XI.) v. COSGROVE. Played at Cosgrove on Saturday, the L. and N.-W. winning by eight wickets. Scores: L. and N.-W. 2nd XI., 22 and 23 for two wickets; Cosgrove,22 and 21. For the winners R. Packer made 8 not out, G. Covington 9, and in the second innings Covington made 7, Packer 7, and A. Clewitt 7, and for Cosgrove T. Long made 8 not out, and C. Burnell 7 and 6 respectively. WOLVERTON BRITANNIA v. COSGROVE.Played at Cosgrove on Saturday last, the visitors winning on the first innings by 49 runs. Scores :Britannia, 81; Cosgrove, 32, and 58 for eight wickets. WOLVERTON L. AND NW (2nd XI. v. COSGROVE.This match took place at Cosgrove on Saturday, the home team winning on the first innings by 10 runs. Scores :Cosgrove 34 and 62; L. and N.-W. (2nd xi. ), 24. For the winners C. Lawless made 14 runs, and A. Clark 8 the first innings, and in the second innings J.Bugby 18 (not out), C. Lawless 12, Hilton 8, and Meadows 7. For the L. and N.-W. W. Harnett made 8 runs, and H. Lloyd 8. 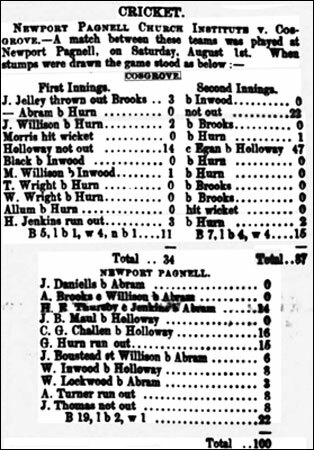 In bowling for the L. and N--W. Packer, Jones, Dixie, and Harnett were most successful, and for Cosgrove Meadows took six wickets, Clark two. Lawless one, and Hilson one. By the kindness Mr. J. Atkinson, of the Priory, the teams were entertained to tea on the ground. COSGROVE CRICKET Club ANNUAL DINNER.On Saturday evening last the annual dinner of this club was held in the schoolroom, when the Rev. R. G. Mc- McDouall presided over a company of about forty, including Colonel Murray, Mr. J.J. Atkinson, Mr. F. D. Bull, Mr. Seymour, Mr. W. Pike &c. Dinner was served in good style by the committee, and the loyal toasts were duly honoured. Responding for the toast of the Army and Navy, Colonel Murray thanked them for the way in which it had been received. The Army was, he said, strong as ever it had been. They needed, however, to be efficient, for the five great powers in Europe had twelve millions of men well armed and thoroughly efficient. Speaking of the Navy, be thought if the present government remained in office, it would be much more efficient and stronger in two or three years than it was at present, and as good or better than any nation in Europe. He spoke on the question of the registration of horses, and thought the government had taken a step in the right direction. With regard to volunteers, he held a very high opinion of them, and thought they needed to be well equipped and their commissariat arrangements well looked after. " Success to the Cosgrove Cricket Club," was given by the Chairman and received with enthusiasm. The secretary, Mr. H. Martyr, in response, thanked them cordially, and read the balance sheet, shewing receipts £3 9s 5d., and expenditure £2 15s 0d. The club had played sixteen matches, won ten, drawn one, and lost five. The health of Mr. J. J. Atkinson was drunk with musical honours, and, in reply, Mr. Atkinson said he should have much pleasure in doing anything for the Club, which he wished every success. “The visitors " was proposed by Mr. F D. Bull, and responded to by Mr. W. Pike. “The health of Colonel Murray, Mr. F. D. Bull, the chairman were heartily drank. Songs were given during the evening by Messrs. F. Brawn, W. Pike, W. Wright, W. Meadows, F. D. Bull. A E. Jones. H. Sibthorpe. &c. Mr. A. E. Jones presided at the pianoforte. A pleasant gathering terminated at 10.30 p.m. with Auld Lang Syne. WOLVERTON BRITANNIA v. COSGROVE.These teams met at Cosgrove on Saturday, when the home team won by 12 runs. Scores : Cosgrove, 67 and 59 ; Britannia, 55. For the winning team J. Smith scored 46, and Gomersall 12 (not out). In the second innings J. Wise 13, and W. Wright (not out) 10. For Britannia H. Godwin made 18 runs, R. Williams 14, and W. Berry 10. In bowling for Britannia the honours were chiefly shared between Worrall and Williams, the former taking 5 wickets in the first innings and 3 in the second and Williams took three and five. For Cosgrove Brown and Meadows took five each. COSGROVE. CRICKET CLUB ANNUAL DINNER. The annual dinner of the Cosgrove Cricket Club was held on Saturday evening, in the Schoolroom. A capital dinner was provided by Mr. A. Bianchi. About 35 sat down, and the Rev P. G. McDouall (Rector) presided. Amongst those present were Mr. T. Anchor (senr. ), Mr. J. J. Atkinson (C.C.). Mr. F. D. Bull, Mr. F. Whales, Mr. W. Pike, Mr. J. Hemmings, Mr. J. Hills (secretary Wolverton Britannia C.C. ), &c.
After the loyal and patriotic toasts had been honoured, Mr. Whales proposed "The health of the Clergy," to which the Chairman responded with a short speech, which he spoke of the activity now existing in the Church of England. Mr. J. J. Atkinson then proposed "Success to the Wolverton Britannia Cricket Club," and Mr. Hills (secretary) acknowledged the compliment. Mr. Atkinson also proposed the toast of the evening "Success to the Cricket Club," and complimented the club on its state of efficiency. They owed great deal to Mr. Bianchi. Mr. Panter responded.Other toasts were "The Visitors," "The Chairman," "The Health of Mr. J. J. Atkinson and Mr. F. D. Bull" (which was received with musical honours), "The Health of Mr. Bianchi," "The Press," and "The Ladies." A pleasant evening was spent, and songs were given by Messrs. Wheatley, Bickley, F. Whales. F. D. Bull, J. Hemmings, W. Wright, Bugby. Jones, W. Meadows. T. Anchor, Burnell, Gomershall, J. Hills, Panter, Harding. &c. Mr. A. E. Jones presided at the piano. The club has played 15 matches, of which they won 12, lost two, and one was drawn, Mr. Smith made the highest score. Cricket : Stony Stratford v. Cosgrove. This match was played at Stony Stratford, and after very close contest resulted in a win for Cosgrove by one run on the first innings, the scores being and 63. One little accident marred the game, Hilton (who was playing for Cosgrove) having his finger broken by endeavouring to catch a very swift ball. Bostock and Son's v. Cosgrove. Played at Cosgrove Saturday, when an interesting game ended in favour of the visitors. Score :Cosgrove, 36 and 40 ; Bostock's, 37. The visitors started badly, losing six wickets for seven runs, but S. Craddock joining W. Read the score was raised to 33, when the first named was out for useful seven. With the last man in, Bostock's were still one run behind, hut they just managed to secure this and also the additional run required to win before last wicket fell. W. Read batted well for 23. Brown, with eight wickets, bowled best for Cosgrove. The home team again batted, scoring 40. In the first innings the home side J. Bugby made 12, and Craddock took six wickets for 18 runs. The annual supper of the Cricket Club was held in the Schoolroom on Saturday, a capital meal being provided by Mr. Cowley. Colonel Murray presided, and he was supported by Rev P. G. McDouall, rector; Mr. J. J. Atkinson, C.C., Mr. P. D. Ball, Mr. W. Pike, Mr. Wales, Mr. Anchor, Mr. J. Hills, secretary Wolverton Britannia Cricket Club, and others. The secretary's report showed the club to be in a sound financial condition. COSGROVE. Cricket Club. The annual meeting was held Saturday. Mr. Bianchi presided. The balance-sheet showed a balance in hand of £2 8s. The officers were then elected for the coming season. WOLVERTON L. AND N. W. v. COSGROVE. These teams met in the Big Field, Wolverton, on Saturday, when the home team won easily by 66 runs. Scores: Wolverton L. and N. W., 96; Cosgrove, 30. For the winners Packer made 35 runs, Giles 17, and Coles 16, and Worall took two wickets for 13 runs, and Elliott six wickets for 17. 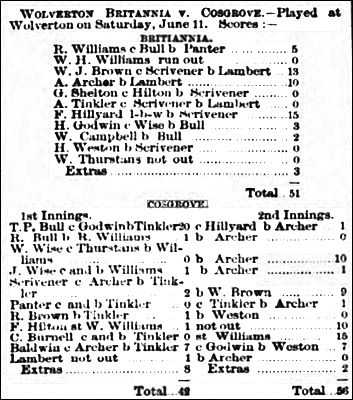 The highest scorer for Cosgrove was W. Wise (10), and Rogers took three wickets and Burnell six wickets. BOSTOCK’S. COSGROVE.On Saturday about thirty members of the former club visited Cosgrove. The visitors batted first, scoring 61, of which K. Wright made 14 and Eyre 10. Varnish and Bugby bowled best for Cosgrove. The home team fared badly against the bowling of Craddock and Jones, scoring 24 only. On a second attempt they lost four wickets for 43. CRICKET CLUB ANNUAL DINNER. The annual dinner of this village cricket club took place on Saturday evening, Oct. 31, in the Schoolroom, when a fair number sat down to a capital and bountiful repast, provided by Host H. Willison, of the Plough Inn. The gathering was presided over by the Rev. P. G. McDouall, rector, who was by supported by Mr. F. D. Bull and Mr. H. Whales. The usual loyal and patriotic toasts were duly honoured, and the toast of the evening “Success to the Cosgrove Cricket Club," by the chairman, was responded to by Mr. Wright, who spoke of the successes the club had achieved during the last season, and hoped they would prosper more next. The evening was spent in toast and song, a very enjoyable time being spent. During the evening the chairman announced that Mr. J. J. Atkinson, C.C., was unable to be present owing to having met with an accident. STONY STRATFORD TOWN v. COSGROVE. Played at Cosgrove, when the home players won an interesting game by the narrow margin of one run. Stratford went in first and made 36, against which Cosgrove made 37, the only person to reach double figures in either innings being W. Woollard (20) and E. French (10) being the principal scorers. Wolverton Britannia v. Cosgrove. These teams met at Wolverton on Saturday, when the home team won by nine runs. Scores: Britannia, 51 Cosgrove, 42 and 56. For Wolverton, F. Hillyard made 15 runs, W. J. Brown 13, and A. Archer 10; and in bowling Tinkler took seven wickets and B. Williams three. In the second innings Archer took six wickets Weston two, and Brown and Hillyard one. For Cosgrove T. P. Bull made 20 runs, C. Pennell 15, F. Hilton not out 10, W. Wise 10, and Scrivener 9. In bowling Scrivener took three wickets, Lambert three, Bull two, and Panter one. Stony Stratford v. Cosgrove. These elevens contested supremacy on the grounds of the former on Saturday, when Stratford gained an easy victory by 23 on the first innings. In the home team’s total of 61, the Rev. W. E. Wallace figured conspicuously with 28: while on the Cosgrove side Baldwin made 12. A. Baldwin bowled in good form for the home side, and R. Bull was very successful in that direction for Cosgrove. 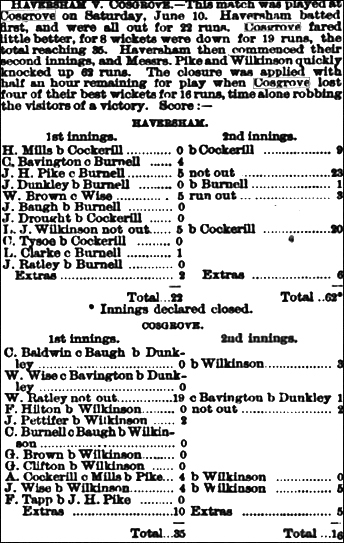 This match was played on Saturday at Cosgrove, and ended victory for Bostock's. Scores: Bostock's, 93; Cosgrove, 38. After the match, tea was partaken of at Mr. Knight's, the Plough Inn, and thoroughly enjoyed by all. In the evening a smoking concert was held, songs being sung by members of both teams, accompanied Mr. F. Johnson, and ended in a very pleasant outing. Played at Cosgrove on Saturday and ended in favour of Trinity by 72 runs. Cosgrove : First Innings R. Brown b Tompkins 0; (second innings) b Tompkins 25; G. How, c Beal, b Tompkins 0; c Gascoyne, b Dunkley 4; E. Jelley b Dunkley 1, b Dunkley 30; W. Wise b Tompkins 2, b Coombs 0; W. Brown b Tompkins 1, c W. Jones, b Coombs 11; C. Baldwin b Tompkins 0, b Tompkins 1; H. Jelley b Dunkley 1, b Beal 0; B. Brown b Tompkins 0, c and b Coombs 0; G. Bugby, c Beal, b Tompkins c not out 3; A. Jelley not out 0 b Coombs 5; J. Brown b Tompkins 0, c E. Jones, b Coombs 0, extras 8, extras 7, total 1st Innings 17, total (2nd innings) 86. Played at Cosgrove on Saturday last and resulted in a win for the visitors by 39 runs. Batting first, Tathall End scored 96, to which total C. Evans contributed 98, W. Walker 19 and F. White 14. Cosgrove replied with 57, A. Cadd (20) and A. Jelley (11) being the chief scorers. Details : TATHALL END; F. Herbert c A. Jelley b W. Jelley 0; F. White b W. Jelley 14; G. Walker ran out 8; B. Grace b W. Jelley 1; W Walker b W. Jelley 19; H. Grace b Knight 0; C. Evans b Knight 38; F. Geary c G. Jelley b Cadd 2; H. Weatherhead b Cadd 2; W. Mills b Cadd 1; C. Mills not out 7; extras 2, total 96. COSGROVE: H. Barnwell c W. Walker b Herbert 1; A. Cadd c W. Walker b White 20; J. Knight c Herbert b White 2; A. Jelley b W. Walker 11; T. Lord c W. Mills b W. Walker 0; E. Eglesfield b White 2; F. Williams c Geary b W. Walker 4; W. Jelley b White 0; B. Tack not out 4; extras 6, total 57. Cosgrove entertaining us stony Stratford 11 on Thursday evening one and interesting game by eight runs. A remarkable bowling feet was performed by C. Evans of Cosgrove, who claimed on all the stony Stratford wickets for a small cost of 19 runs. Calverton: S. Tompkins b Evans 1, P. Edwards c Kingston b Evans 2, W Boughton c Eglesfield b Bushell 4, J. Tompkins b Evans 9, S Bird b Evans 13, V. Tompkins lbw b Evans 1, R Eales c Dunkley b Evans 4, G Goodger not out 9, F Whitehead b Evans 0, W. Morgan b Bushell 6, H Chamberlain b Bushell 0, extras 8 total 57. Bowling: T Bushell three wickets for 21 runs, C. Evans six for 10, A. Tompkins 1 for 11, B Tack 0 for 7. Bowling: S. Tompkins five wickets for 18 runs, S Bird 4 for 34. Cosgrove: A Noble 10, E Noble 5, J Eglesfield 13, A Lavington 0, A Castle 18, W. Ratcliffe 1, A Bushell 0, H Smith 2, F. Lambert 11, S Kightley 2, T Lovesey not out 2, Priestley 1, extras 1, total 66. Cosgrove Hall: J Prisley 11, H Ray 0, G. Ellis 6, R Ealey 0, G Beasley 2, W Crowder 0, A. Tompkins 53, C Harmston 1, E J Lambert 12, H Cummings 5, E R Lambert 1, E C Lambert not out 3, extras 7, total 121. Cosgrove had a cricket team on duty for the first time in many years on Sunday when their young side visited Wicken. The home team included a number of youngsters, including 11 year old Raymond Bloxham, but had to field more seniors then was intended. Wicken declared at 155 for five and dismissed the visitors, who put up a good show for 92 runs. Wicken: R Canning 30, F Bloxham 27, J Higgs 43, W Case 5, M. Wootton not out 9, M Green 14, J. Folker retired 24, R Bloxham not out 13, extras 13 total for five wickets declared 177 - D. Berrill three for 22. Cosgrove: E Spokes 4, T Hefford 8, D. Beryl 25, C Bushell 7, R. Waite 1, P Hickford 21, J. Berrill 0, H Smith 0, D Cannings 7, J. Lambert not out 6, H Meakins 10, extras 2, total 92. M. Watson 3 for 7, J Higgs 2 for 4, F Bloxham 2 for 3. Cosgrove cricket received a fillip on Saturday when a village team had a handsome win over neighbouring Old Stratford. 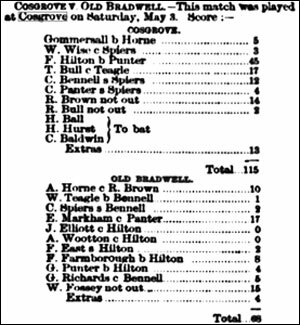 Cosgrove owed much to F Hill, who scored 44 runs out of a total of 68, and then took four wickets for four runs in nine overs. D. Berrill backed this up by taking 3 for 5, and Old Stratford were dismissed for 22, six of their side failing to score. Note: fillip - something which acts as a stimulus or boost to an activity. Based in the railway town of Wolverton in North Buckinghamshire, Wolverton Town CC was founded by staff from the Railway Works in 1894. In 1901, they settled at their home ground in Osborne Street where they continue to play today. 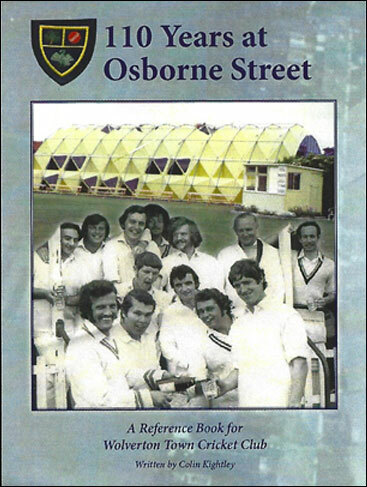 This comprehensive and fascinating book is a labour of love written by former Railway Works employee and Wolverton Town CC player Colin Kightley. It charts the highs and lows of Wolverton Town CC, including being homeless at the turn of the century and becoming Champions of the Northants County League in 1972. It contains full statistics for all players who have represented the Club between 1894 & 2011 and gives a detailed account of the Wolverton KO Cup, one of the oldest cricket knockout competitions in the country. In addition, match reports from the finals of the Railway Shops Competition. An interesting read and a must for any cricket enthusiast.